Thomas Wolfe once said, "You can never go home again." The acclaimed writer from Asheville, North Carolina never met fellow Southerner Matt Keller. After high school, Matt left his native Tennessee to wrestle at the University of Nebraska … but was called home for family reasons, and is now a senior at the University of Tennessee at Chattanooga (UTC), where he is ranked sixth in the country at 133 pounds, and may well bring home an NCAA title this March. Matt Keller grew up in the Cleveland, Tennessee area, just thirty miles northeast of Chattanooga. "When I was six years old, dad took me to the local Boys' Club for their wrestling program," says Matt. "You see, he was a high school wrestler." "It took three years to wipe the smile off my face." Matt put smiles on the faces of wrestling fans at Bradley Central High School that lasted four years. He delighted the crowds by wrestling varsity his entire high school career, compiling an incredible 140-2 record, and winning four straight Tennessee state championships. Despite these accomplishments, Matt says he was not heavily recruited in high school, admitting during the interview for this profile that he never won a national title. However, he did attract the attention of perennial powerhouse Nebraska. His very first college recruiting trip was to visit the Cornhuskers, and he signed right away. "I liked everything -- the coaches, being able to train with Jason Powell, great facilities," says Matt, who spent three years in Lincoln (one of them as a redshirt freshman). "It was the right choice for me at the time." While at Nebraska, Matt made positive contributions for the Cornhuskers right from the start. As a freshman, he built a 28-12 record, finishing just one win shy of earning All-American honors in the 133-pound weight class. His sophomore year, Matt went down to 125, and, despite some challenges staying at that weight, went 20-8. Both years he placed third in the Big 12 conference tournament. It was at this time that Matt's father David was called to serve in the Army in Afghanistan. 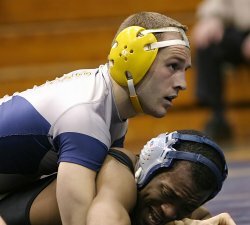 At Matt's request, Nebraska head coach Mark Manning released the wrestler from his scholarship, allowing him to transfer to UTC. At the time, coach Manning told the Omaha World Herald, "Matt wants to be closer to home, so he can be there to support his mom and his family. I completely understand his decision. We've had a great relationship and I wish him the best." When asked what schools he considered to be closer to his family while his dad was overseas, Matt said, "I didn't consider going any place else." However, the move back home meant some major adjustments for the Tennessee native. "It was very hard to leave my friends at Nebraska," says Matt. "I still talk to Jason Powell once a week." "The level of competition from the Big 12 to UTC was a big difference … At Nebraska, it was like having a title match every week. I really got beat up. Here, I'm fresher each week." Matt also seems to be a bit more at home in terms of the academic environment in Chattanooga. "There are about 8,000-10,000 students at UTC. The classes are smaller, more personal," says the UTC senior. In his first season at UTC, Matt Keller made a big splash for the program. In addition to moving back to Tennessee, Matt moved back to the 133-pound weight class after being at 125 his last year at Nebraska. As a junior, Matt compiled a 37-11 overall record, with twelve of those wins scored by a pin, and nine by major decision. Among the highlights of the regular season in 2005-06: Winning the Reno Tournament of Champions in 2005 … and upending top-ranked Tom Clum of Wisconsin, 9-5. 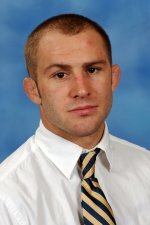 Matt took home the 133-pound title at the 2006 Southern Conference Championships, and was voted Outstanding Wrestler of the event. He earned a ticket to Oklahoma City for the 2006 NCAA's, where he claimed All-American honors by placing eighth in a talent-rich weight class. Coming off a great first season at UTC, Matt Keller faced yet another change to deal with: A new head coach. Change seemed to be one constant for Moc wrestlers and fans. In the past three years, UTC has had two athletic directors… and three head wrestling coaches: Terry Brands, Joe Seay, and now Chris Bono. Coach Bono, who had been an assistant to Seay before being named head coach in July 2006, brings to the job an impressive resume in terms of wrestling and coaching experience. 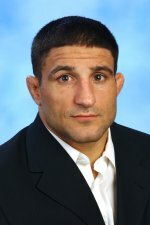 A 1997 graduate of Iowa State and 1996 NCAA champ at 150 pounds for the Cyclones -- as well as being a three-time US World Freestyle Team member -- Chris Bono was an assistant at his alma mater for nine years under long-time head coach Bobby Douglas before coming to Chattanooga in 2005. In a published interview, Matt said of his new head coach, "I obviously have great respect for what he's accomplished as a wrestler … Bono is a really good coach -- everybody around here loves him. He's brought some stability to our program and everybody is on board with him." The positive feeling is mutual. "Matt has an incredible work ethic. Definitely one of the hardest workers in the room," says Coach Bono. "He's one of my leaders. He buys into what I'm saying, which means the world to me as a first-year head coach." "I've seen tremendous growth between this year and last year with Matt," the Mocs head coach continues. "He's matured in all aspects -- not just in wrestling, either … He's grown up in his perspective on the mat, and in life in general." It appears that maturity is shining through in Matt Keller's winning performance in his last year as a collegiate wrestler. As of this writing, he is ranked sixth in the 133-pound weight class by RevWrestling.com, with a 14-2 record. In early December, Matt took the title at the Cliff Keen Las Vegas Invitational, winning five straight matches … including a 9-7 overtime victory in the finals over last year's 133-pound NCAA champ Matt Valenti of the University of Pennsylvania. In addition, he won the 133 bracket at the Missouri Open, and secured decisive dual-meet wins over competition from Virginia Tech (by major decision) and Ohio State (by pin). Immediately after Christmas, Matt brought a perfect 10-0 record to the 2006 Southern Scuffle, held at the Greensboro (North Carolina) Coliseum Special Events Center. Matt, the top seed at 133, breezed through his first two bouts (winning one by tech fall) before running into Cornell sophomore -- and eventual 133-pound champ -- Adam Frey, who edged the Mocs senior, 10-9. Matt eventually placed seventh. When asked about Matt Keller's senior year success, Mocs head coach Chris Bono said, "He's gone out and wrestled hard. He really believes in his conditioning. It's not just that he's in top condition to go the distance in every match and wear the other guy down, but that his mental aspect is in top condition, too." Ask him about his goals for the current season, and Matt's first statement is, "I'm focused on finishing up school, earning my degree in Sociology." But then he immediately follows up with, "Winning a national title is very important to me. I dream about it every night." After he graduates, Matt hopes to continue his mat career as a freestyle wrestler. Ideally, he would like to be a wrestling coach, "hopefully college, somewhere close to home." In separate interviews, both Matt Keller and Chris Bono discussed how things are changing for the better in terms of wrestling in the state of Tennessee and surrounding region. "Each year, Tennessee high school wrestling gets better and better," according to Matt. "More coaches who grew up in Tennessee are coming back to coach high school." Coach Bono said, "When I first came to UTC, no one thought of national titles. Now fans in the area are talking about the possibility of our wrestlers winning national championships." "This area is starved for wrestling," adds the new coach. "Folks are attracted to the sport. They seem to like what they see down here. We're thrilled with the level of support we've been getting." Perhaps one reason for increased fan enthusiasm in the region may be Matt Keller's attitude towards life on and off the mat. In talking to Matt, his down-home, easy-going spirit comes shining through. Yet it's not at all a contradiction when he says, "I like a battle. I'm a warrior." That combination of one-day-at-a-time attitude and warrior spirit could be the winning combination that helps Matt Keller bring home a national title … a first for him, and a first for UTC and the state of Tennessee as well.